A fight occurred in an American Airlines flight on Wednesday. Video courtesy of Bill Bolduc. A man was arrested this week after allegedly engaging in a fight aboard an American Airlines flight from St. Croix to Miami. In a statement, American Airlines said a "disruptive passenger" caused the airline to request a law enforcement response for Flight 1293 on Wednesday. The passenger who was arrested was disorderly with other passengers and crew members while in the air, according to American Airlines. 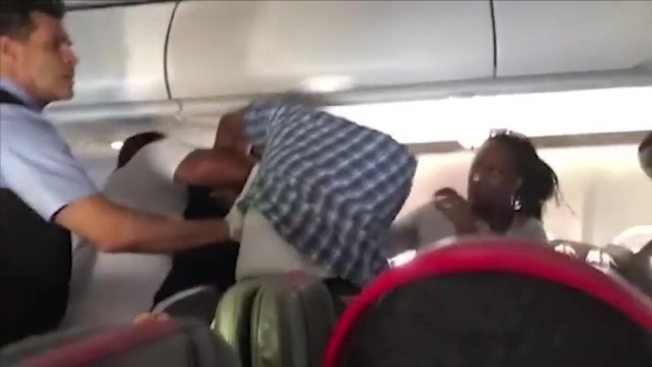 Video of the alleged incident, posted by YouTube user Bill Bolduc, shows three men in a scuffle aboard the plane. A flight attendant can be seen working to break up the fight. Another video posted by Bolduc shows the man in a black T-shirt later being escorted off the aircraft by law enforcement. "We thank our crew for taking care of our customers and are proud of the work they do every single day," American Airlines said. The passenger involved in the altercation became agitated when a flight attendant would not allow him to purchase more beer, the Miami Herald reported. A criminal complaint alleges that the flight attendant suspected the man, identified as Jason Felix, was already drunk and federal law prohibits an airline from serving alcohol to intoxicated passengers, according to the Herald. Felix allegedly escalated the verbal altercation with the flight attendant, which resulted in a physical confrontation aboard the flight with others who tried to intervene, according to the criminal complaint.